I have the pleasure of introducing to you to Manuel Pinto Coelho, MD, PhD (in Educational Sciences), an anti-aging medical coordinator and medical doctor who was determined to do what he could to help improve the ALS condition of his son, Bernardo Pinto Coelho. This father and son are from Portugal. Bernardo was diagnosed with Motor Neuron Disease (MND), the type also known as Amyotrophic Lateral Sclerosis (ALS), in 2009 and the diagnosis was confirmed in 2010. I first learned about Bernardo’s story via a YouTube video. Bernardo reports that the progression of ALS has stopped. I believe that it is important for people to hear about stories like Bernardo’s to see the value that an integrative/holistic approach can have for some people. I was particularly intrigued with the father’s discussion of Bernardo’s intense psychological/trauma/lifestyle stress factors prior to the development of ALS, and his findings of the same in a good number of cases of ALS patients with whom he has become acquainted. His observations reflect those of Dr. Gabor Mate, author of When the Body Says No, and those made by myself in exploring the experiences of people with ALS. 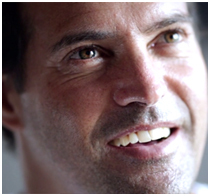 CLICK HERE to watch Bernardo’s video and CLICK HERE to read his essay about his holistic healing journey from his perspective. Following Bernardo’s essay, he provides a statement (ADDENDUM) pertaining to his case, written by his treating medical doctor who is an esteemed Professor of Physiology at the Faculty of Medicine at the University of Lisbon, Portugal. ALS is a degenerative neuromuscular disease. After being diagnosed, the traditional, allopathic medicine reports that the average lifespan is three to five years. There are two forms of Amyotrophic Lateral Sclerosis: sporadic, which happens in 90 percent of the cases ─ the type my son Bernardo suffers from ─ and familial. The latter is typically caused by mutations in different genes. The sporadic form has to do with circumstances of an extensive range. So far, scientific research has not yet understood its pathogenesis, but I have researched some theories – the glutamate toxicity theory and also the mitochondrial dysfunction, oxidative stress, environmental toxins and viral theories. Up to now, western classical medicine has followed the theory related to glutamate toxicity ─ glutamate accumulation in the interval between each neuron. That space separating neurons from one another has an accumulation of glutamate which contributes to neuronal degeneration. The classical medicine approach has to do exactly with that, trying to avoid the accumulation of glutamate in this space. The only medical intervention is the one that recommends riluzole (“Rilutek”) uptake, the only drug approved to treat this disease, which does little more than extending a few months to the lives of patients affected with ALS. Obviously, as a father of a son with such a problem, I could not stand idly at the prospect of the deterioration of his condition ─ exclusively motor not psychological, because ALS does not encompass the psychological part. Patients keep their cognitive and sensory abilities. The disease is entirely neuromuscular. Among the examined theories, I highlighted the one that seemed to be the most suited to slow ALS progress down or even to make it regress: mitochondrial dysfunction. It is well known that ALS always implies a greater or lesser degree of mitochondrial suffering. 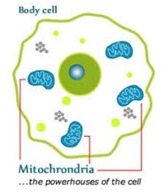 The mitochondria is a small subunit within the cell, a kind of engine room or the power station within the cell, responsible for the production of its energy. The production of this energy is loss-making in the case of diseases such as Bernardo’s, although not only so. It is believed that this is also the case for other diseases such as Multiple Sclerosis, Parkinson’s disease and Alzheimer’s disease. Mitochondrial dysfunction has actually been the prime target of my research and attention ─ hence my son’s use of supplements in order to protect and better feed the mitochondria, thus preventing its cease of operation which might cause neurons premature death. To allow the reader to better understand this, just imagine you have a car. It only works if you supply it with appropriate fuel to have the power to run the engine. The fuel that empowers the mitochondria has to be transformed into energy and there are substances that do so, similar to what the motor does in the case of a car. There is a kind of conductor who oversees the whole process and there are certain types of substances which, according to my research, are involved in this story. In sporadic cases, ALS is essentially about mitochondria suffering. Bernardo says his mitochondria are sad and he has a point. Being ill-treated mitochondria, we must give them the best possible fuel. It cannot be just any fuel, it has to be super. And the process of transformation of this fuel into ATP (adenosine triphosphate) has to be well monitored so that this process unfolds in the best way. Basically, this is the aim of the intervention. Food, supplementation, exercise and syntonic therapy have everything to do with this process of providing good fuel to the mitochondria. It is also the way to help the mitochondria take good care of its fuel and convert it into energy, cell by cell, so that the signs and symptoms of the disease disappear. Still, in an effort to help Bernardo and other people who suffer from the same problem, I have not neglected other possible factors that might be behind the onset of the disease, such as viral infections and environmental toxins including heavy metals like aluminum, lead, mercury, arsenic, and cadmium as well as pesticides such as those used on football fields lawns, which may possibly explain the unusual high ALS incidence acknowledged in soccer players in Italy. Hence the use of chelation therapy, exemplarily performed by Dr. Maria Francisca Almeida, in order to detoxify Bernardo of these pollutants which may – who knows – have also been contributing factors responsible for the onset of his disease. To minimize oxidative stress, Bernard also makes use of several anti-oxidant supplements. The idea conveyed nowadays is that ALS is a real death sentence, like cancer. But, in fact, it does not have to be so. Approaches to oxidative stress and mitochondrial suffering deserve more attention, in my perspective, and I have been focused on them. Modern medicine has well addressed glutamate accumulation. The 16 supplements Bernardo is taking, the adapted motor activity he undertakes as well as the psychological approach, by means of internal stress maneuvers, address oxidative stress and mitochondrial suffering. It is common knowledge we continuously form new cells, new neurons. The brain has plasticity, is malleable, and is not in a static condition. It is a constantly changing and dynamic process; its connections can be reconfigured in the face of new experiences and thoughts. This is the strength of psychotherapy, its rationale and the reason for its success. It is amazing how our neurons may be affected by our way of life. Stress, certain type of repressed experiences or high anxiety levels can inhibit neuronal growth. But it takes eleven months to renew our neurons, after which we have a fully renovated neuronal mass. But for this to happen there must be calm conditions, there must be a total absence of anxiety. It is a reality that suffering blocks the production of new neurons, much to do with cortisol – which is released in these circumstances by the adrenal glands – and it is true that stress decreases the brain’s ability to recreate and replace them. People who remain quiet possess another capacity to produce new neurons. Often there are devastating situations behind the onset of phenomena such as these. In my clinical practice, I have noticed that more or less devastating situations of emotional trauma precede the outbreaks of a significant percentage of ALS cases. What Dr. Carlos Fugas does with his syntonic therapy is exactly to remove internal stress to allow this process to occur orderly, so that neuronal renewal happens in order to reduce the outbreak of diseases like Bernardo’s. This is the basis of syntonic therapy that this brilliant psychologist, a friend of mine in this day and age, has taught Bernardo with touching dedication, diligently and patiently. By removing his internal stress, my son has not only avoided the premature death of his neurons, but he has achieved its renewal more easily as well. He is a living example that, faced up with new experiences and new emotions, one can reconfigure, one can produce differently, one can arrange their neurons otherwise. Conclusion: psychotherapy, if targeted, can cause morphological changes in the brain of the patient. 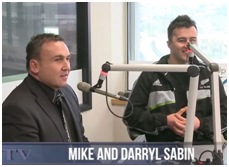 “The power of the mind knows no limits,” recalls Mike Sabin, New Zealand MP, after helping his son Darryl with persistence and touching perseverance after severe traumatic brain injury during a rugby game that left him in a coma for three months. Mike Sabin refused to listen to the best New Zealand experts ─ New Zealand’s highest ranked surgeons and neurologists ─ who without any hope, advised to switch off the machine to which his son was connected. This father, accompanied by a team of eligible therapists, went to the gym with his son for four hours on a daily basis. Any results? Six years later, his son Darryl recovered 85% of his mobility. Due to his father’s persistence, Darryl Sabin has a normal life today! In New Zealand, everyone knows Mike Sabin because of this extraordinary outcome and his book, “The Long Way Home”, which was an immediate bestseller. Inspired by Mike Sabin and with Bernardo in my mind, I realized it makes no sense to resign ourselves just because we are told nothing can be done. What goes on in our brain is still in the shadow of scientific knowledge. António Damásio and any neuroscience researcher will say the very same thing. Therefore, we do not have to sit idly and accept the prognosis associated with ALS without a fight, regardless of whatever medicine or any other branch of science reports. Getting back to medicine, there may be a genetic predisposition for developing ALS. But although the gene may be there ─ it seems so, at least in the so-called “familial” form ─ there may not be anything that actually pulls the trigger. Since 2003 ─ the date when the human genome was revealed to have about 23,000 functional genes ─ epigenetics started to stand out. Bernardo may have been born with the gene, which could be a driving force to suffer from a disease of this kind in the future, but it could have never broken out, had it not been for the enormous problems he went through, one after the other, functioning as a trigger. When people develop ALS, I believe that if they are provided with adequate food, proper supplements uptake and if they adopt a different guided lifestyle, imbued with hope for healing, they may be able to stop the process. vitamins in due proportion, as well as minerals, amino acids, enzymes, antioxidants and essential fatty acids, so that cells are provided with enough power and quality. Cells need high quality fuel, and food is undoubtedly the best source, as Hippocrates put it, 400 years BC: “Food is our best medicine and our best medicine is food.” All it takes is to give the bodies what they need and remove what is ‘poisoning’ them. Lastly, a treatment that has recently shown promising results is the one that uses ursodesoxicolic acid, a bile acid which exists in small quantities in humans whereas abundant in the bile of black bears. For centuries, this bile acid has been used to treat hepatobiliary disorders. Approved by the US Food and Drug Administration, it has now revealed to bring therapeutic benefits to several neurodegenerative diseases, including amyotrophic lateral sclerosis (ALS), with South Korea approving its use in this regard in 2012. As several studies undertaken by Dr. Dora Brites ─ a researcher from the Faculty of Pharmacy, University of Lisbon, Portugal, Biochemistry and Human Biology and Research Institute for Medicines ─ have demonstrated, the neuroprotective properties of this compound and its derivatives (glyco-ursodesoxicolic and tauro-ursodesoxicolic acid) are multiple, including as regards motor neurons, in an experimental model of ALS. At a clinical trial carried out in Italy, in ALS patients, published this year, it has been demonstrated that the administration of tauro-ursodesoxicolic acid was well tolerated and decreased disease progression, with results sustained over 54 weeks treatment, with a 2 grams daily dose. Based on this evidence, Bernardo started associating 4×250 mg of ursodesoxicolic acid to his daily treatment, duly supervised by the aforementioned researcher. Given the current prospects to have ALS patients lose functioning until they are reduced to a wheelchair, living in the doldrums of more or less worsened days yet to come mitigated by palliative care safely provided with much love and affection; I believe that, in Bernardo’s disease case, the answer may actually be in St. John of the Cross’ quote: “to walk the path of the unknown”. Regrettably, Bernardo experienced some emotional aggressions preceding ALS, all in all equally devastating. I am not saying these circumstances are the cause for all ALS cases, but let there be no doubt that there is an extremely high rate of these situations in the development of this disease. When I recalled the disappointments Bernardo had in his life, I thought: “This has to be the way, there is no other explanation”. The healing power is within us. Everything depends on how one chooses to live. Health can be restored in a much faster way, subsequent to what one endeavors, based upon the way one chooses to live; rather than dependent on the pill that one chooses to take or not to take. When we eat and live according to both the needs of our cells and our biological equipment, correcting its deficiencies and imbalances, the body can finally focus on regenerating and healing; then, a dramatic shift takes place which changes a person’s life. With or without ALS! 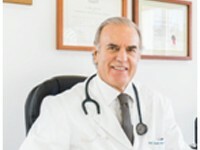 Manuel Pinto Coelho, M.D., Ph.D. (in Educational Sciences) is a highly esteemed medical doctor in Portugal who has used his training and research to develop a multifaceted approach to address the condition of amyotrophic lateral sclerosis (ALS) in his son Bernardo Pinto Coelho, who has reported benefiting from the holistic program. Prof. Pinto Coelho is the Medical Coordinator for the Inflamaging Physician Network and is Visiting Professor at University of Trás-os-Montes e Alto Douro (UTAD). He has a specialty in Anti-Aging Medicine, including a new approach to auto-immune diseases, and received a post-graduate degree in Anti-Aging Medicine at the Universitat Autonoma de Barcelona. Prof. Pinto Coelho is a Member and Researcher at Research Center in Sports Sciences, Health and Human Development (CIDESD), Chairman for the Association for a Drug Free Portugal (APLD), and is National Representative for European Cities Against Drugs (ECAD). He is also the former Personal Physician of the Prime-Minister of Portugal and a former medical doctor of a professional football team, Sporting Clube de Portugal. I have ALS and want to try your treatment. Steve, I don’t have a treatment but if you email drcraigoster@comcast.net and I will send you my summary when I complete it. -electrodes to be placed on the skin in particular areas – you can purchase a e-stim machine on line. COQ10+magnesium+L-Carnitine+D-ribose and add LDN (low doses naltrexone) 4.5 mg daily to be taken between 9pm and mid night. What are the 16 supplements that your son is taking? My husband has ALS. He is taking some supplements, I’m curious as to what you have found to be most beneficial. If you receive the supplements please copy me. I also have ALS. contact the author, whose email address is in the bio at the end of the article. I have been diagnosed with ALS. Of course the approach of the medical profession is to have routine visits to monitor my slow demise (my words). I am therefore treating myself with a change of diet, supplements and Yoga. I recently started this approach. I am taking guidance from a book written by a doctor, which says that the approach is to make the body more alkaline, and take supplements that boost cell metabolism. I am interested to know the 16 supplements that you have identified. I am only taking 10 supplements along with coconut oil and ginger and honey. Any other advice or direction will also be welcome. I would like to know about these supplements too. Any advise welcome from any source. So hard to pin down a starter programme. I was recently diagnosed with ALS and would love some help. I refuse to give up. recently diagnosed with ALS and would appreciate and helpful knowledge that I can use to combat this disease. I want to help my brother. He has been doing all sorts of treatment for over a year. Spending all of their money on ALS. He is worse than ever. I believe there is still hope for healing. Please help me, so I can help him. I am diagnosed with ALS on March 2016, but it all started on 2014. I am very sensitive for many years to radiation like WIFI, mobile and all wireless devices. We shut down all internet at night. Some results for me were better, less viruses, bacterias, fungi and candida, but no improvement in my muscles, swallowing and breathing. What can I do further on ?